The great Charlton Heston played Mark Antony twice, in little seen film adaptations of Julius Caesar produced twenty years apart. That is all well and good, but Nick DeMaio is more interested in the 1953 Joe Mankiewicz version starring Marlon Brando. Not surprisingly, Brando is an icon for the blue collar Italian American actor, who specializes in extra work on mafia movies. DeMaio is determined to produce and star in a staging of Julius Caesar to broaden his acting horizons. However, along with his gangster extra cronies, he will unknowingly cast a real life Mafia boss and an undercover Fed in his very Italian-American Caesar. 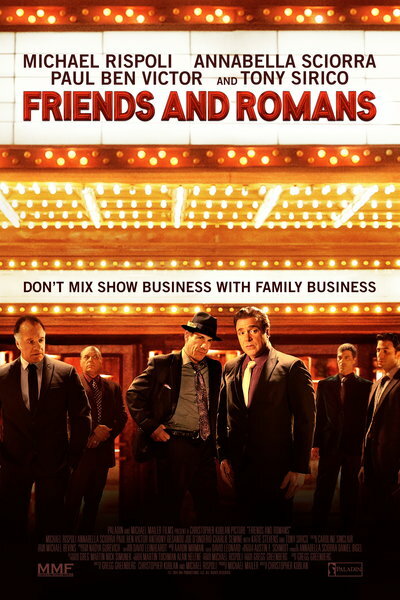 Complications will ensue, as they do, in Christopher Kublan’s Friends and Romans (trailer here), which opens this Friday in Jersey and Long Island. DeMaio was in Godfather III, Goodfellas, and The Sopranos, but he only had one slightly embarrassing speaking part. Nevertheless, the movie extra work has nicely supplemented his income as a wholesale produce deliveryman. Still, the broad ethnic stock characters are starting to big him. He would like to be taken seriously as an actor, so he latches onto Shakespeare’s Caesar as the vehicle to make it happen. As luck would have it, he rents the abandoned theater where real life mobster and aspiring actor Joey “Bananas” Bongano is hiding out. Even though he is wanted for murdering a Broadway producer (seriously, that is probably just a misdemeanor), he can’t stop himself from auditioning for DeMaio. FBI agent “Paulie” Goldberg also successfully auditions, suspecting DeMaio and his cronies are involved with the secretive Bongano, whose features and thespian pseudonym remain unknown to the Feds. Granted, FAR is a bit sitcom-ish, but it is immensely likable. Kublan and co-screenwriters Michael Rispoli and Gregg Greenberg also incorporate a number of clever references to Shakespeare’s original text. Frankly, it is a much smarter film than one might expect, even though there are no shortage of jokes derived from Italian stereotypes. As DeMaio, Rispoli balances goofiness and earnestness rather well, never overindulging in either. We just so get exactly who he is supposed to be, but he still wears well over the course of time, like a broken-in pair of shoes. Annabella Sciorra is grossly underemployed as Angela DeMaio, but at least she develops some pleasant chemistry with Rispoli. It is also nice to see her character support her husband’s eccentric ambitions right from the start, rather than merely serve as an emasculating dream-deflator. Almost by necessity, most of the gangster-looking supporting cast is serving up shtick of some kind, but Paul Ben-Victor’s shtick is funnier and flashier than the rest as Dennis Socio, DeMaio’s limo driving buddy, who agreed to direct because he once did a limited run of Tony & Tina’s Wedding on the Island. FAR is not exactly getting over-distributed this weekend, but it is destined to become a word of mouth sleeper hit on DVD and VOD. It gently spoofs gangster movie conventions, before tying everything up in a big “feel good” bow. You can be snarky all you want, but it works at the audience level. Recommended for fans of backstage comedies, the entertaining, low stress Friends and Romans opens this Friday (11/6) in the Tri-State Area.